I have been reading Dan Everett’s fascinating account of life and language in the Amazonian jungle, Don’t sleep, there are snakes. He went as a missionary to the Pirahã, to learn their language with the intention of translating the New Testament into it. Rather than his converting them, however, it was they who ultimately undermined his Christian beliefs. He has now written a number of learned articles about their language, as well as this excellent popular account of the years he spent living with them. The Pirahã language, according to Everett, has no numerals, no way of counting, and no quantifiers. More dramatically for Chomsky’s ideas about linguistic universals, he claims it has no grammatical recursion. He makes an excellent case for this claim, as far as I can judge, but Chomsky’s reaction was reportedly to denounce him as a charlatan. 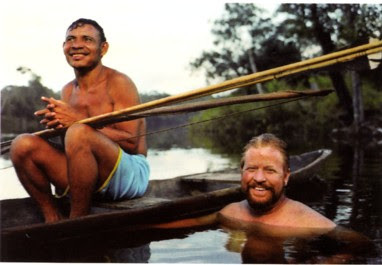 Phonetically, Pirahã is remarkable for having very few phonemes: just eight consonants for men, /p b t k g ʔ s h/, and three vowels, /i a o/. Women have one consonant fewer, since they replace /s/ by /h/. There is some striking allophonic variation: /b/ is [m] when initial and a trill [ʙ] between the vowels i and o; /g/ is [n] when initial, and between i and o can be a kind of linguolabial lateral (the ExtIPA symbol for this is l̼). There’s a sound file of the spoken language here. In Pirahã orthography it has been decided to use the letter x to represent the glottal stop, which is of frequent occurrence in the language. Unfortunately on the page of phonetic explanation the printers of Everett’s book have got the IPA symbol wrong: Oh no, it isn’t: it’s ʔ. A small matter, but somehow typical of non-specialist printers and publishers. Moral: when proof-reading, always check phonetic symbols particularly carefully. How true. Unfortunately there's a limited number of times you can make the same correction on successive proofs. You make a detailed sketch of the relevant symbol in question, you quote its unicode reference, you supply a link to an entire Wikipedia page about it, and they will still get it wrong. Sometimes, in fairness, a certain glyph will simply not exist in the font they've unwisely chosen. But mainly, I sometimes cynically think, it's because "they" can't really bring themselves to believe it actually matters very much... In this case there are presumably two mistakes in one -- they were going to use the question mark, qua nearest to the real symbol, but ended up with the oblique that shares the same key.
" but Chomsky’s reaction was reportedly to denounce him as a charlatan." On behalf of the mulitude of people, who're too polite to say it: Takes one to know one. To defend Chomsky, something I am loath to do, the reason many, many people have issues with Dan Everett is not because he doesn't make convincing arguments, but because he is very secretive with his data. He won't allow anyone access to anything except the few example sentences he publishes. With radical claims like his, I think it's very important to be open and show people that your claims are indeed well-founded, and Everett seems hesitant to do this. I may be too forgiving, but may impression is that Everett has fallen in love with the Pirahã people - not with his hypothesis. But, yes, it would be nice if he would release some corpus for others to pour over. Sili: Considering that the world is full of people who have the CURE=FORCE merger, I don't think that's much of a fault. Admittedly, most of them make CURE sound like FORCE, not vice versa. @Sili: and actually the word you want is spelt "pore", not "pour". You *pore* over something you are studying, but you *pour* tea or coffee. D'oh. Of course I want "pore"! I knew - this is what I get for correcting my pronunciation of "pour". I used to not understand how people could make exactly this mistake that I now made. Pardon me while headdesk. "Don't sleep there are snakes" is magnificent and it brought my attention really closer to the idea of melting internatinal boundaries using language - yet, the processes that we have to overcome before reachiing that level is still quite huge.